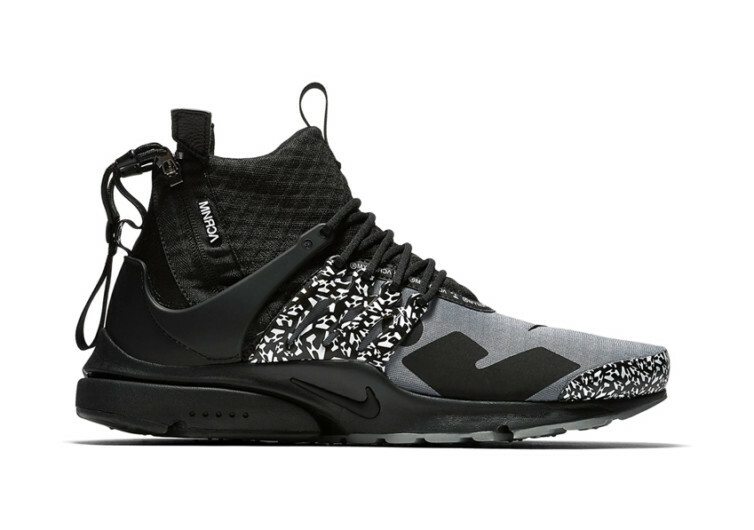 Technologically modified to bring humankind an entirely different kind of footwear experience and one that allows them to express their creative side, the collaboration between Acronym and NikeLab brings to the footwear-loving world the new Air Presto Mid Acronym Cool Grey. 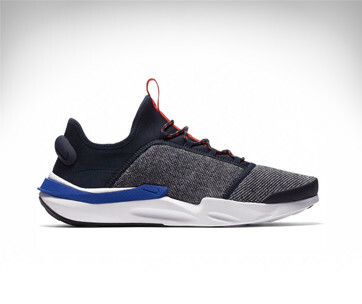 Inspired by the prospects of a much better tomorrow, the Presto Mid blends functional design with technical utility in a remarkable aesthetic form. 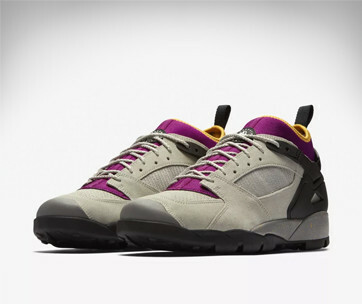 Erollson Hugh continues to defy the logic of conventional shoe design by integrating a more tech-inspired graphic and color scheme. After all, we live in an era where almost every facet of man’s existence is enmeshed with technological advances. The tech-inspired scheme adds a more futuristic appeal to the Presto while giving it a new twist that one will be surprised it came from Nike. 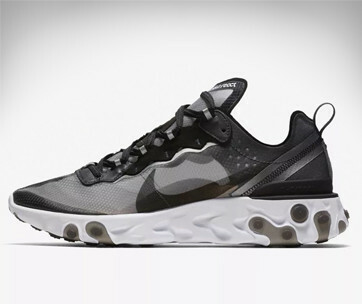 Hugh’s signature “A” for Acronym has been morphed into a camouflage pattern which has an uncanny resemblance to the Moc 2 x Acronym VaporMax. It’s an interesting take and a sure-fire way to generate enthusiasm among the Mid loving crowd. The utility-focused ethos of Hugh is clearly identifiable within the intricate design of the Presto. With a zippered collar, the Presto can be easily worn and removed without so much as breaking a sweat. It’s the kind of footwear you can easily kick off your feet so you can get right into the action while also affording you the security when in full motion. The mesh upper still follows the original design of the Presto at the turn of the new millennium, however. And the midfoot overlays have clearly evolved from the classic 2000 Presto support structure. 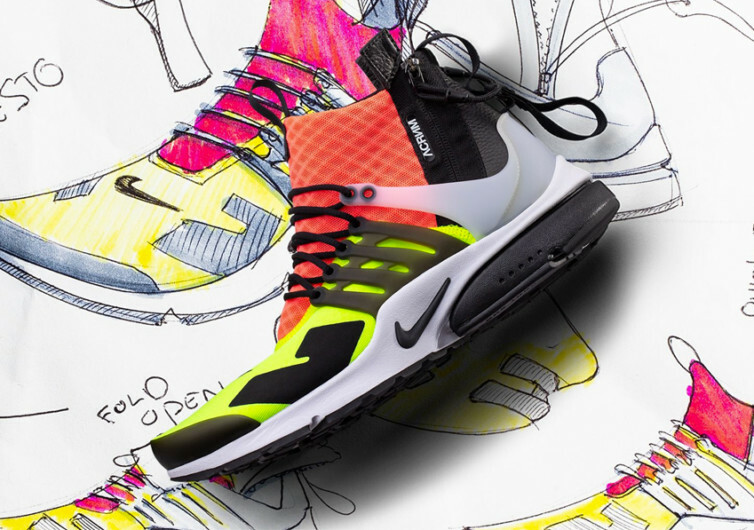 To say that the Air Presto Mid Acronym is nothing less than a work of art is obviously an understatement. This footwear is designed to wow the tech-crazed crowd in pretty much the same way as celebrities create a firestorm of interest over some fancy antics. Aside from the Cool Grey, the Presto also comes in Dynamic Yellow and Pink Racer colorways – proof that Nike and Acronym are doing their part in addressing the unique requirements of an ever-changing yet equally demanding shoe-loving world.